The JACK Quartet, violinists Christopher Otto and Austin Wulliman, violist John Pickford Richards, and cellist Jay Campbell, has been honored with numerous awards. It will perform 7:30 p.m. Sunday, Jan. 27 at First Presbyterian Church, 314 Xenia Ave. Tickets are $25. For more information, visit www.cmys.org or call 937-374-8800. 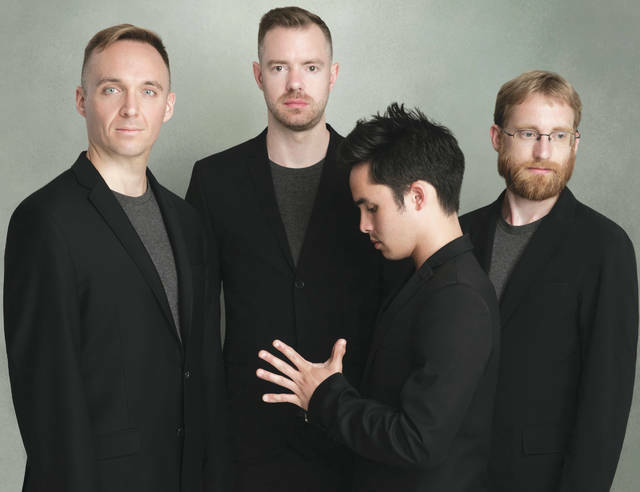 YELLOW SPRINGS — JACK Quartet will perform for area audiences Sunday, Jan. 27, sponsored by Chamber Music in Yellow Springs. As a special tribute to new music, for this concert only, Chamber Music Yellow Springs is offering free admission to those under 25 years of age and anyone presenting a student ID. JACK (violinists Christopher Otto and Austin Wulliman, violist John Pickford Richards, and cellist Jay Campbell) has been honored with Lincoln Center’s Martin E. Segal Award, New Music USA’s Trailblazer Award, and the CMA/ASCAP Award for Adventurous Programming. JACK has performed to critical acclaim at Carnegie Hall, Lincoln Center, and venues across the United States, as well as overseas venues in Europe, the United Kingdom, Japan, Canada and Mexico. Dedicated also to education, JACK teaches and collaborates with students in music festivals and in residencies at a number of universities across the U.S. The concert will begin 7:30 p.m. at First Presbyterian Church, 314 Xenia Ave. (U.S. 68) in Yellow Springs. Charles Larkowski, professor emeritus of music at Wright State University, will give a preconcert lecture starting at 6:45. A post-concert dinner will provide those interested with an opportunity to meet the performers. Call 937-374-8800 by Jan. 24 to reserve a space. Further information and tickets for the performance are available at www.cmys.org or by phoning 937-374-8800. Tickets start at $25. https://www.fairborndailyherald.com/wp-content/uploads/sites/50/2019/01/web1_JackQuartetpic1.jpgThe JACK Quartet, violinists Christopher Otto and Austin Wulliman, violist John Pickford Richards, and cellist Jay Campbell, has been honored with numerous awards. It will perform 7:30 p.m. Sunday, Jan. 27 at First Presbyterian Church, 314 Xenia Ave. Tickets are $25. For more information, visit www.cmys.org or call 937-374-8800.